We had our big charity fundraiser, a poker tournament back in early June and formerly kicked off our 3 Up 3 Down non-profit where we gave away $12,000 to youth leagues and charities that support those with developmental disabilities at our July 28th All Star Game. 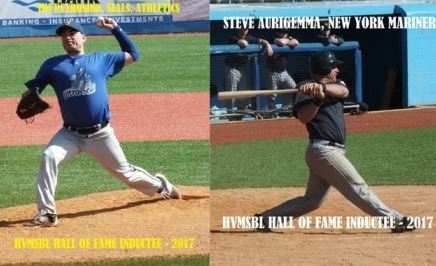 We also inducted Jim Petrosino, Steve Aurigemma and Barry Zehnbauer into our Hudson Valley MSBL Hall of Fame. August 7, 2017 – Brewster, New York – The 3 Up 3 Down Organization (3U3D) put on the 2017 Hudson Valley Men’s Adult Baseball League All Star Game on Friday July 28, 2017 at Dutchess Stadium, Wappingers, New York as well as the presentation of $12,000 in local grants to six local baseball organizations and five local charities including Green Chimneys, Anderson Center for Autism, Fragile X Research Foundation, Zylophone and Julies Jungle. The event was FREE to all in the community and the Organization had free hot dogs, cotton candy and water for the 1,000 fans in attendance. The first 100 kids received free a wiffleball bat and ball set and kids that returned foul balls received free fidget spinners. Vendors were present providing discounted glove embroidery, free face painting for the kids, free yoghurt and juices, and free bat demos (Axe Bats) as were other vendors/sponsors including ATT, Carmel Sports Club, BSN Sports, Hayes Fitness and Noosa Yoghurt. Preceding the game was the league’s annual home run derby which was won by Marlboro resident Steve Aurigemma. The All-Star Game pitted the Hudson Valley Men’s Amateur League’s (HVMSBL) 18+ age division and its 35+ age division all stars. Many of the top former high school and college players now call the HVMSBL home including local standouts Zack Graczyk (Carmel and SUNY Cortland star), Jake Slate (former Arlington), Clint Boettcher (SUNY New Paltz), Marty Hand (Iona College, and Steve Green (Boston College, Brewster High star). Honored on the evening was Barry Zehnbauer (Wappingers), Jim Petrosino (Ketchum), and Steve Aurigemma (Marboro, Florida Atlantic), three of the most prolific ball players in the Hudson Valley over the last 15-20 years. All three were inducted into the HVMSBL Hall of Fame.Through its fundraising efforts this year, 3U3D can offer up to six baseball grants annually to local leagues. The six recipients went through a qualifying grant application process. 2017 recipients included the Town of Kent ($1,000), Beekman Athletic Club ($1,500), Town of Wappingers Little League ($1,000), East Fishkill Babe Ruth ($1,000), as well as the Town of Poughkeepsie Babe Ruth ($1,000) and City of Poughkeepsie Little League ($2,500). The mission of the 3 Up 3 Down Organization is to promote, strengthen, and foster youth baseball in and around the Greater New York and Hudson Valley areas, as well as provide additional community support for those with developmental disabilities. The Organization has a longer term goal of building an inclusive park for those with and without disabilities. Such a park will enhance the health, physical fitness, wellness, independence, and an enhanced quality of life through inclusive fitness programs, including recreation and sports competition for people of all abilities and all ages, in community based, and accessible multi-use park(s). In its short existence, the non-profit has already put on Major League Baseball’s Pitch, Hit & Run and Junior Home Run Derby for ages 7-14-year-old boys and girls and established key partnerships with several recreation departments and youth leagues to benefit from its donations.